T-cells are the immune system’s security force. They seek out pathogens and rogue cells in the body and put them out of action. Their precursors are formed in the bone marrow and migrate from there into the thymus. Here, they mature and differentiate to perform a variety of tasks. 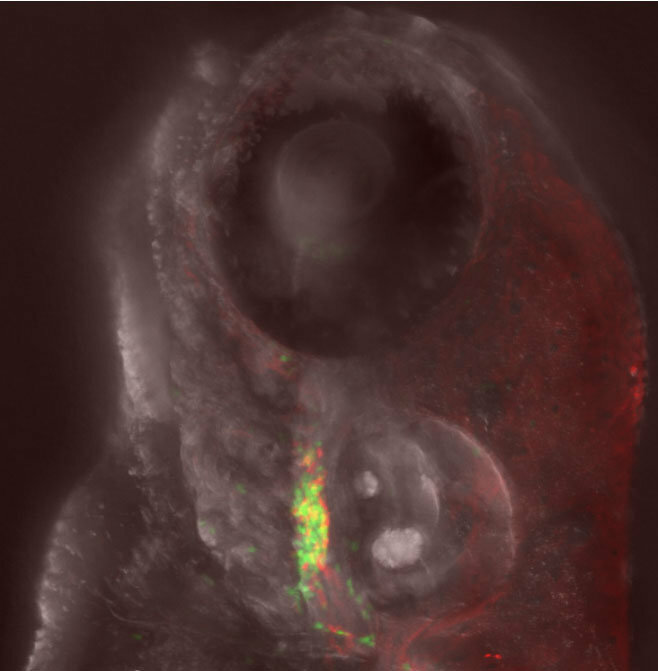 Scientists at the Max Planck Institute of Immunobiology and Epigenetics in Freiburg have now succeeded for the first time in observing the maturation of immune cells in live zebrafish embryos. During their development, the immune cells migrate into and out of the thymus more than once. The zebrafish is thus an ideal animal model for studying the dynamic processes of immune cell development. The thymus is a small, inconspicuous organ, but it is also vital for a functional immune system. This is because it is the development site of the T-lymphocytes (T-cells), which play a central role in the body’s immune defences. Their precursors come from the bone marrow and are lured into the thymus by chemical attractants called chemokines. Once in the thymus, they develop into different T-cell types, which are eventually deployed into the rest of the body. A research team at the Max Planck Institute of Immunobiology and Epigenetics in Freiburg has now succeeded for the first time in observing these processes live. They have tracked the real-time development of T-cells in living zebrafish embryos, starting with the formation of the thymic anlage (the cluster of embryo cells from which the thymus develops), via the cells’ migration into the organ from the bone marrow, right up to the stage when the fully formed T-cells are released from the thymus. As the researchers discovered, this is a highly dynamic process: the precursor cells do not take a direct migration route into the thymus. Instead, they seem “undecided” and leave the organ several times before they finally settle there. “So far, we have no idea why this happens”, says Thomas Boehm, Director at the Freiburg-based Max Planck Institute, who leads the study. The cells also migrate within the thymus. “This dynamic behaviour was previously unknown, as we were not able to observe the cells for any length of time”, explains the scientist. These observations also show that the migration from bone marrow into the thymus is driven by the chemokines alone and is largely independent of the blood circulation. For their study, the investigators used genetically modified zebrafish embryos. They are particularly well suited for this type of research, as the thymus is embedded in translucent tissue and the embryos can be observed live under the microscope. T-cell development in the zebrafish is comparable to that of mammals. The researchers used a fluorescent dye to make the thymus tissue visible. They labelled the immune cells with a different fluorescent protein, which changes colour from green to red when it is exposed to light. By illuminating the thymus, they were then able to watch the green cells migrate into the thymus, while the red cells migrated back out again. “This change in colour clearly shows that the same cells were involved”, says Thomas Boehm. The technique also made the cell movements within the thymus visible: if the scientists briefly exposed only a small area of the thymus to the light source, they could then observe green and red cells gradually mingling back together again. Zebrafish mutants without a beating heart provided the researchers with proof that the precursor cells do not simply follow the blood flow when they migrate into the thymus, but that they are instead attracted there by the chemokines. The researchers in Freiburg have thus succeeded in tracking the development of immune cells in a vertebrate for the first time. “It turns out that the zebrafish is well suited for this kind of experiment”, says Thomas Boehm. “For example, we can now carry out direct tests to determine what effect certain substances have on the formation and maturation of the T-cells and the thymus tissue”. Therefore, the study not only contributes towards a better understanding of the way the immune system works, the method could also help with the development of drugs to treat malfunctions of the thymus.